To Cite: Siti Junaidah A, Suhaini S, Mohd Sidek H, Basri D F, Zin N M. Anti-Methicillin Resistant Staphylococcus aureus Activity and Optimal Culture Condition of Streptomyces sp. SUK 25, Jundishapur J Microbiol. 2015 ; 8(5):e16784. doi: 10.5812/jjm.16784. Background: The potential of secondary metabolites extracted from Streptomyces sp. to treat bacterial infections including infections with Staphylococcus aureus is previously documented. The current study showed significant antimicrobial activities associated with endophytic Streptomyces sp. isolated from medicinal plants in Peninsular Malaysia. Objectives: The current study aimed to determine anti-methicillin-resistant-Staphylococcus aureus (MRSA) activities of Streptomyces sp. isolates. Materials and Methods: Disc diffusion and Minimum Inhibitory Concentration (MIC) assay were used to determine the antibacterial activity of Streptomyces sp. isolates. Optimization of fermentation parameters for the most potent anti-MRSA extract in terms of medium type, pH, aeration rate, and culture period was also carried out. Lastly, toxicity of the extract against Chang liver cells was determined employing the MTT, 2- (3, 5- diphenyltetrazol-2-ium-2-yl) -4, 5-dimethyl -1, 3 - thiazole; bromide assay. Results: The results indicated Streptomyces sp. SUK 25 isolates showed the most potent anti-MRSA activity. Disc diffusion assay revealed that spread plate technique was more efficient in screening anti-MRSA activity compared to pour plate (P < 0.05). To determine anti–MRSA MIC of Streptomyces sp. SUK 25, Thronton media was used. Therefore, MIC was determined as 2.44 ± 0.01 µg/mL, and accordingly, the lowest MIC was 1.95 µg/mL based on a seven-day culture, pH7, and aeration rate of 140 rpm. The crude extract was not toxic against Chang liver cells (IC50 = 43.31 ± 1.24 µg/mL). Conclusions: The Streptomyces sp. SUK 25 culturing was optimized using Thronton media, at pH 7 and aeration of 140 rpm. Further isolation and identification of bioactive compounds will develop anti-MRSA therapeutics. Endophyte bacteria is an organism that lives in plant tissues, and acts as symbiont with the host and secreted beneficial products (1). Examples of metabolites with medicinal value were taxol, cryptocin, and cryptocandin (2). The study by Zin et al. (3) showed that the secondary metabolites of endophytic Streptomyces possessed characteristics similar to anti-fungal agent. These secondary metabolites were extensively studied and the obtained antibiotic compounds were reported by researchers and pharmaceutical agencies (4, 5). Finding alternatives for MRSA treatments need to be initiated. It is reported that Metabolites obtained from Streptomyces sp. act as antibacterial agents against pathogenic bacteria. Authors' previous work indicated that endophytic Streptomyces sp isolated from medicinal plants in Malay Peninsula had significant antimicrobial activities (6). The current study aimed to determine the most potent Streptomyces sp. isolates, SUK 25, as anti-MRSA agent and evaluate its optimal culture conditions as well as the cytotoxic effect. The sample of entophytic actinobacteria, SUK (Strain of University Kebangsaan Malaysia), and MRSA were obtained from the Novel Antibiotic laboratory in UKM, Kuala Lumpur. The SUK collection namely SUK 25, SUK 27, SUK 28, and SUK 30, and MRSA culture were MRSA ATCC 33591, MRSA ATCC 43300 and MRSA 49476. These endophytic Streptomyces sp. were previously isolated from medicinal plants in Malay Peninsula (7). The SUK 25 and SUK 27 were isolated from Zingiber spectabile, while SUK 28 and SUK 30 were isolated from Sarcandra glabra and Oroxylum indicum, respectively (8). The 14-day culture was on ISP 2 (International Streptomycetes Project 2) agar at 28°C and maintained at -80°C in 20% glycerol (Merck, USA) solution (9), while MRSA strain was maintained on Mueller Hinton Agar (Merck, USA) (MHA) supplement with 2% Sodium Chloride, NaCl (Sigma Aldrich, USA) at 8°C. Bioassays of 4 isolates of Actinobacteria from various sources of medicinal plants (SUK 25, SUK 27,SUK 28, and SUK 30) were screened against MRSA ATCC strains of 33591, 43300, and 49476 (7). One cubic centimeter (1 cm 3) of matured actinobacteria was placed on nutrient agar (Merck, USA) lawn with MRSA. The inhibition zone was measured after overnight incubation in which Vancomycin (30 µg/disc) (Oxoid, UK) was used as positive control. These 4 isolates were then preceded for fermentation in nutrient broth followed by extraction and tested against MRSA through disc assay method. Known amounts of extract (in methanol) were placed on blank disc (6 mm diameter, Whatman ™, Gred AA) (Sigma Aldrich, USA), then dried in the hood. After that, the disc was placed on the MHA already lawn with MRSA. This culture was incubated overnight at 37°C. After overnight culture, the inhibition zone was measured for each plate and Vancomycin (30 µg/disc) (Oxoid, UK) was used as a positive control. Culturing techniques, spread plate method (SPM) and pour plate method (PPM), were used according to the standard method (10) for the selected SUK (based on anti-MRSA properties), which was SUK 25. These steps meant to determine the capability of extracts exploited from SUK 25 to penetrate the target MRSA cells efficiently. Culture conditions for the production of anti- MRSA was determined by inoculation of 5-6 cubic centimeter (~1 cm3) of matured SUK 25 from ISP 2 media into one-third of 1 L Erlenmeyer flasks (Pyrex, USA) each containing a sterilized 400 mL broth. The flasks were incubated for 7 days at 28°C with aeration rate of 160rpm. Eight fermentation medium with modified formula were used, namely A3M Media (11), Bn-2 Media (11), ISP 9 Media (12), Czapek-Dox Media (13), Bennette Media (6), Thronton’s Media (14), Heydorn Media (15) and Nutrient Broth (Merck, USA). After that, the selected media was optimized based on its anti-MRSA activities, whereby the involved parameters were incubation period, pH level of the media and aeration rate. Ethyl acetate extraction (3) was employed to harvest the secondary metabolite from the fermented broth after 7 days of incubation. Culture filtrates were extracted with three half-volume of ethyl acetate. After that, solvent phase was concentrated with rotary evaporator (Buchi, Switzerland) at 40°C and was left to dry. The obtained crude extracts were suspended in methanol (Sigma Aldrich, USA) and used for MIC determination assay against MRSA (10). The SUK 25 extracts exploited from different media (namely, A3M Media, Bn-2 Media, ISP 9 Media Czapek-Dox Media, Bennette Media Thronton’s Media, Arney Heydorn Media and Nutrient Broth) were preceded for MIC determination. The concentration used in this study was 0.488 µg/mL-1000 µg/mL. The IC50 values were obtained from a dose-response curve for each tested extract. The obtained data were assessed using IBM SPSS version 21. The ANOVA (Analysis of Variance) was employed and the level of significance was P < 0.05. Post-hoc test (Post Turkey test) investigated the differences between data (P < 0.05). As documented in Figure 1 (ii), the crude extracts of 4 isolates namely SUK 25, SUK 27, SUK 28 and SUK 30 were used to screen anti-MRSA metabolites. These four isolates were screened to determine their capability in producing secondary metabolites. At this stage, the SUK 25 isolate was found a potential anti-MRSA agent. The inhibition zones of MRSA ATCC 49476, MRSA ATCC 43300, and MRSA ATCC 33591 were 30 mm, 20 mm and 21 mm respectively when reacting against SUK 25 extracts compared to Vancomycin with inhibition zones of 16 mm, 15 mm dan 15 mm, respectively. In addition, the one-way ANOVA indicated that data for the inhibition zone of MRSA ATCC 43300 produced by SUK 25 extracts were significantly different, using pour plate and spread plate techniques (P < 0.05). The spread plate method (SPM) exhibited a significantly higher inhibition zone value against MRSA ATCC 43300 compared to pour plate method (PPM) at 19 ± 0.26 mm and 15 ± 0.38 mm, respectively by Post Turkey HSD test. SPM was selected to screen the secondary metabolite against MRSA, since this technique produced a significantly bigger inhibition zone than PPM (P < 0.05), Figure 1 (i). Parameters used to determine the optimal culture condition for the best anti-MRSA activities of SUK 25 included type of media, fermentation period, pH media, and aeration rate for optimal oxygen sources. According to Figure 2, eight media namely A3M, ISP 9, Bennette, Nutrient Broth, Arney Hedron’s, Bn-2, Thronton’s and Czapek-Dox were screened to enrich the secondary metabolite production of SUK 25. The activity can be assessed by measuring its capability to produce the lowest MIC value to inhibit MRSA ATCC 43300 as well as high weightage of the dry weight of the crude extracts produced by SUK 25 with constant volume of 400 mL, initial pH 7, and an incubation period of 7 days. Growth curve of SUK 25 (Figure 3) in the Thronton medium was measured using Absorbance reading at 625 nm (A625). The result showed that the bacteria enter the stationary phase on the 7th day. Therefore, the secondary metabolites were harvested after 7 days of culture growth. Figure 4 shows that the lowest MIC value (2.44 ± 0.01 µg/mLg/mL) was through incubating the SUK 25 in Thronton’s media followed by Czapek-Dox with 5.86 ± 0.01 µg/mLg/mL, Arney Hedron’s with 6.25 ± 0.1 µg/mLg/mL, Nutrient Broth and ISP 9 with 1000 µg/mLg/mL, Bennette and Bn-2 with 8000 µg/mLg/mL, and A3M media with 32000 µg/mL. While the trends in producing weightage of the crude extracts exploited from the 400 mL media was led by A3M, then Bn-2, ISP 9, Arney Hedron’s, Bennette, Nutrient Broth, Czapek-Dox and Thronton’s with crude extract weightage 104 ± 0.1 mg, 7 ± 0.2 mg 5.8 ± 0.1 mg, 2.8 ± 0.2 mg, 2.4 ± 0.2 mg, 2.3 ± 0.1 mg, 0.9 ± 0.1 mg and 0.5 ± 0.1 mg, respectively. However, it was noteworthy that despite the high weightage value of the crude extract A3M, (104 ± 0.1 mg), its antibacterial effect was the lowest, (32000 µg/mL). Independent t-test revealed that the MIC value of Thronton’s media (2.44 ± 0.01 µg/mLg/mL) was significantly different compared with that of Czapek-Dox (5.86 ± 0.01 µg/mL), P < 0.05. Therefore, Thronton medium was selected as the best media to produce anti-MRSA metabolites (Figure 4). This media contains only one carbon source mannitol and two nitrogen sources namely potassium nitrate and asparagines. 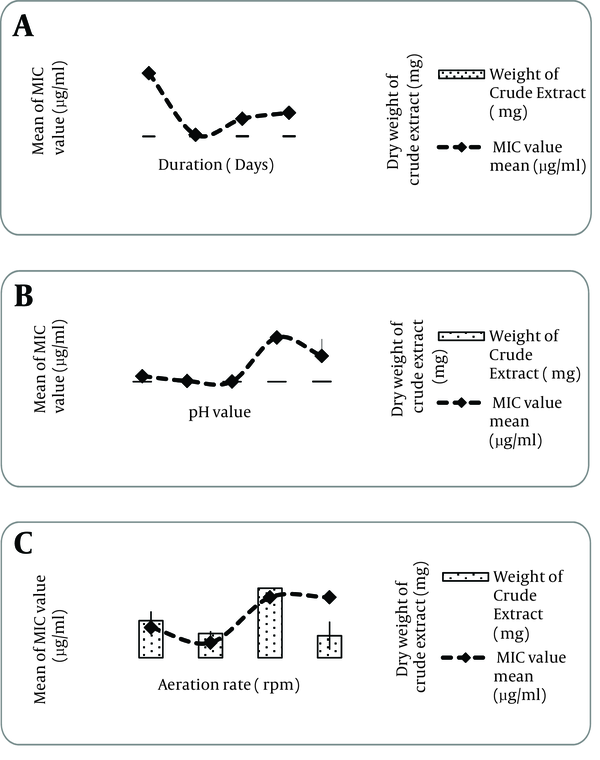 These results showed that the production of crude extracts was inversely proportional to the production of active extracts with potential secondary metabolite. 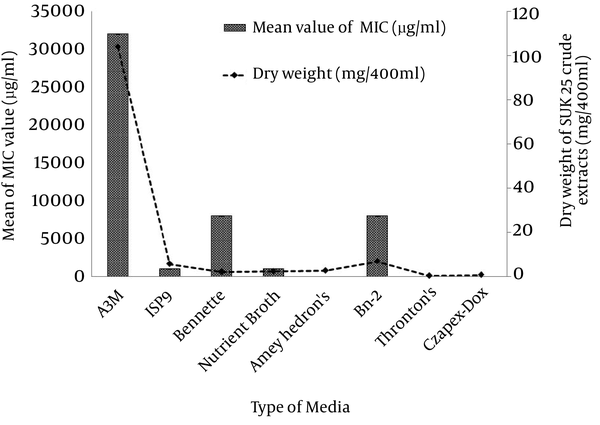 Table 1 presented the comparison between the sources of each media used, their MIC values and the weight of crude extracts produced by the media fermentation. As shown in Figure 4, incubation period, the initial pH medium and aeration rate were optimized in Thronton’s media. The anti-MRSA activity and weightage of SUK 25 crude extract was assessed on the 3rd, 7th, 14th and 21st days of fermentation. As indicated in Figure 4 (i), the 7- day fermentation period produced (P < 0.05) the highest activity (lowest MIC value, 2.44 ± 0.01 µg/mL µg/mL) compared to the other periods of fermentation (P < 0.05). The crude extract produced the highest weightage on the 21st day with 1.2 ± 0.01 mg, (P < 0.05) compared to the other fermentation days of interval except the 14th day fermentation (P > 0.05). 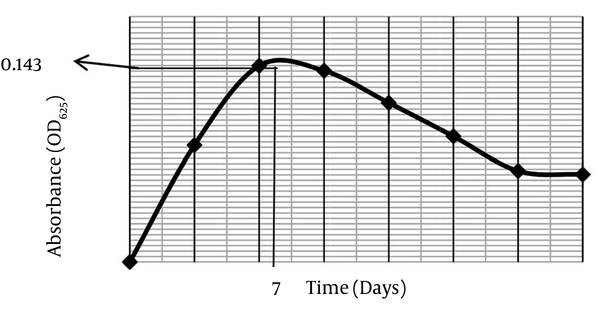 Since the antibacterial effect was selected as the primary criteria, optimum fermentation period was the 7th day of fermentation period (Figure 4). The initial pH of Thronton media was determined through 5 interval values, starting from pH 5 to pH 9 by assessing the MIC value and its weightage of SUK 25crude extract. According to Figure 4 (ii) the highest significant activity, 2.44 ± 0.01 µg/mL, against MRSA ATCC 43300 was from Thronton media formulated at initial pH 7 (P < 0.05). Independent t-test revealed a significant difference between the MIC value of pH 7 media and that of pH 6 media, 7.83 ± 0.01 µg/mL (P < 0.05). However, weightage of SUK 25 crude extract produced by pH 7 media was the second highest compared to the rest of the media tested with 1.97 ± 0.01mg. Therefore, optimum pH for SUK25incubation condition of the secondary metabolites was pH 7 Thronton’s media for 7 days at 140 rpm (Figure 4). In addition, the inhibitory activity of the extract against MRSA ATCC 43300 showed significant difference between the observed data when the aeration rate was adjusted between 120 to 180 rpm, (P < 0.05). However, the aeration rate at 160 rpm and 180 rpm showed insignificant differences (P >0.05) when MIC value obtained at 3.91 ± 0.0010 µg/mL and 3.91 ± 0.0014 µg/mL, respectively. The lowest significant MIC value, 0.975 ± 0.001 µg/mL, was obtained when the aeration rate was at 140 rpm, compared to other resorts (P value < 0.05). There were significantly different data regarding the weightage of SUK 25 crude extract when the aeration rate was adjusted between 120 to 180 rpm, (P value < 0.05). The highest weightage value was observed when the aeration rate was fixed on 160 rpm (P value < 0.05), compared to other aeration rates. However, there was an insignificant value of weightage obtained between 120 rpm and 180 rpm, also between 120 rpm and 140 rpm (P value > 0.013). Chang liver cells were used to evaluate the cytotoxic activities of SUK 25 extracts. The tested SUK 25 extracts showed no toxicity towards mammalian Chang liver cells with IC50 values of 43.31 ± 1.24 µg/mL. It was categorized as nontoxic as recommended by NCI (National Cancer Institute) which IC50 of crude extract over 30µg/mL was defined as no cytotoxic. Carbon Sources Mannitol Sucrose Glucose None Glucose Glucarose Glucose, soluble starch Glucose, Soluble starch, glycerol, reducing sugar, nonreducing sugar, fat and carbohydrate from Pharmamedia SDN BHD. aAbbreviations: MIC, minimum inhibitory concentration; ISP, International Streptomyces Project; Bn-2, Bennette media; A3M, A3M media; SDN BHD, Private limited. Figure 1. (i) Comparison between pour plate method (PPM) and spread plate method (SPM) in culturing bacteria for disc diffusion assay. Crude extracts of SUK 25 and MRSA 43300 were used in the tests. (ii) Inhibitory activity of the selected crude SUK (2 mg/mL) against 3 ATCC strains of MRSA. Note: The bar in both graphs (i) showed standard error of the collected data. Vancomycin (30 µg/disc) was used as the positive control (ii). Note: for all samples pH media, fermentation period, and the volume of media were pH 7, 7 days and 400 mL respectively. Absorbance reading, A625 taken every 3 days interval was plotted at y-axis. Reading for the 7 -day culture of SUK 25 was 0.143, showing SUK 25’s secondary metabolites harvest at stationary phase of SUK 25 growth. Note, Both parameters were measured up to 21days (i), aeration rate scale ranging from 160-180 rpm within 7 days (ii), and pH value of media was analyzed from pH 5-pH 7,(iii). Antibacterial testing of the four Streptomyces sp. SUK isolates was determined to compare the effectiveness of bacterial extract against MRSA. The activity was compared with vancomycin as a control antibiotic. The inhibition of MRSA was assumed to be due to active metabolite action of Actinobacteria. Ghadin et al. (7) reported the inhibition zone produced by the actinobacteria isolate in antibacterial screening assay had the potential medicinal value as an antibacterial agent. In the SPM technique, MRSA cells were spread on the surface of MHA. With PPM technique, the MRSA cells were cultured within MHA. The depth of agar was constant in both techniques, 5 mm. Therefore, SUK 25 extracts (in PPM technique) were potent to penetrate the target cells in the agar incapable. Besides, the secondary metabolites of SUK 25 were extracted using the same ethyl acetate. Hence, SPM technique was much more effective than PPM since the nonpolar compounds in the extracts acted as an anti-MRSA agent compared to polar compounds. In addition, Valli et al. (17) proved that antibacterial screening of Streptomyces sp. crude extracts were practically applied. Moreover, SPM was the standard method in antimicrobial assays applying Kirby- Bauer method (10) and designed for single antimicrobial testing. High catabolism rate of Streptomycetes cells inhibited the production of bioactive compounds as antimicrobial agents (18). Carbon sources in the media were used for bacteria growth and as a source of energy in microorganism of catabolic process. Comparison of carbon sources of the media showed (Table 1) that only the Nutrient media had no carbon source, whereas A3M media with the highest carbon source contained eight different sources as listed in Table 1. The second highest was Bn-2 media with 2 sources and the other media had one source. Other studies (19, 20) reported that Streptomycetes used glucose as a carbon source in their growth. Streptomyces coelicolor produced actinordin more effectively when glucose was added into the fermentation media (20). The best media that produced effective anti-MRSA activities from SUK 25 was Thronton media (MIC = 2.44 µg/mL in Figure 4) with crude extracts weight of 0.5 mg. Table 1 showed that the only carbon source in Thronton media was mannitol. However, carbon utilization test results (data not shown) on ISP 9 standard media showed that SUK 25 did not use mannitol as a carbon source. Hence, the energy was obtained from nitrogen source such as asparagine (C4H7NO4), an amino acid. Borodina et al. (21) reported that asparagines was used as carbon and nitrogen source in S. coelicolor A3 (16) growth. Whereas, Aharonowitz and Demain 1978 (22) found that absence of glycerol in the fermentation media of S.clavuligerus causes asparagines acts as carbon and nitrogen sources for Cephalosporin production. Although Czapek-Dox media had a carbon source, it was not used by SUK 25 as a carbon source. Instead, sodium nitrate was used as the energy source. The MIC value obtained from the extracts produced in this media was slightly higher than those of the extracts exploited by Thronton media, (5.86 µg/mL). Voelker and Altabe, 2001 (23) reported that nitrate compound metabolisms were converted to ammonium, then to glutamine, an amino acid, amino sugar, nucleotide and other secondary metabolites. Sarigullu et al. stated that antibiotic production by Streptomyces sp. changed by formulation of carbon and nitrogen sources in different media (24). In some circumstances, an enzyme secreted in catabolic process may repress the secretion of secondary metabolite. Different types of carbon sources in A3M and Bn-2 media inhibit SUK 25 growth. Therefore, long incubation period is needed to reach the stationary phase and produce active secondary metabolites. Martin et al. 1999 (25) stated that Carbon Catabolite Repression (CCR) occurs when a variety of carbon sources present in the fermentation medium cause inhibition of penicillin produced by Penicillium chrysogenum. In CCR condition, synthesis of enzymes utilizing other substrates was repressed until the primary substrate was exhausted. For example, production of Gentamycin by Micromonospora purpurea was interfered by the presence of glucose and xylose but not by fructose and maltose (26). An assimilation of nitrogen sources was used to synthesize the cellular components such as protein, nucleic acid, cell wall, primer, and secondary metabolite. Comparison of nitrogen sources for the fermentation media, as stated in Table 1, showed that Bennette, Bn-2 and A3M media had three different nitrogen sources. While Bennette and Bn-2 had similar nitrogen sources, namely yeast extract, meat extracts and N-Z case, A3M media had protein with 18 types of amino acid and soluble nitrogen amino. Thronton, Nutrient and Arney Hedron media had 2 nitrogen sources (Table 1). Fermentation media which had limited nitrogen sources were inhibited in the growth process, thus the secondary metabolite production was repressed such conditions in Czapek-dox and ISP 9 media. However, the MIC value obtained from Czapek-dox media (5.86 µg/mL) was lower than that of ISP 9 media (1000 µg/mL). Voelker and Altabe, 2001 (23) stated that antibiotic production occurs when nitrogen sources are limited. According to Barios Gonzalez et al. (27) there were four categories of secondary metabolites. The categories included metabolite from aromatic amino acid syntheses such as cancidin, a metabolite produced from amino acids such as Cephalosporins, metabolite from the metabolisms of acetyl-coA (in Kreb Cycle) such as Erythromycin, and metabolite produced by sugars such as streptomycin. Besides, stationary phase of SUK 25 occurs much faster in Czapek-dox media as a contributing factor in the secondary metabolite production. This is because SUK 25 does not use complex carbon sources such as glucose in ISP 9 media. The MIC value of Arney Hedron’s media (6.25 µg/mL) was also much lower compared to that of Nutrient media (1000 µg/mL). Both sources of nitrogen in the Nutrient media had organic sources, while Arney Hedron’s media nitrogen sources were formulated synthetically. A non-organic source of nitrogen such as ammonium sulfate makes the pH media too acidic due to free acid release of fast ammonia metabolism occurance (28). The best media, Thronton, had asparagine and potassium nitrate. According to EI-Tayeb et al. (29) potassium nitrate was used to produce Rifamycin B by Amycolatopsis mediterranei. This fact was supported by Voelker and Altabe, 2001 (23), nitrate compound reduced to ammonium and nitrogen metabolism for amino acid synthesis and secondary metabolite. In addition, the asparagine was used to supply energy in the catabolic process. However, limitation of the current study was the variety of phosphate and nitrogen content in every medium, not discussed further in other studies. Furthermore, since SUK 25 required longer period to mature, the optimization process prolonged. This secondary metabolite production of SUK 25 occurs during stationary phase (Figure 3) in response to defense mechanism of survival and the protection of the produced spores (30). Kampen, 1997 (28) stated that the appropriate pH level acts as buffer to any change of hydrogen ion concentration (pH) when acid and alkaline are formed in fermentation media. Streptomyces sp. growing better in the pH range of, between pH 7.0-pH7.4 (9). Since the activity of anti-MRSA effects reflected optimum secondary metabolite production, the aeration rate of 140 rpm was selected. aeration supplies the cultured organism with the oxygen (31) and the relationship between aeration rate and oxygen supplied is linear. However, an appropriate oxygen supply resulted in positive effect on growth of cells. As reported by Martins et al. (11), production of secondary metabolite from S.olindensis producing Retamycin could not be affected by a high rate of aeration, but a sufficient oxygen supply at 140 rpm increased the production. In the current study, SUK 25 showed significant inhibitory activity, with MIC value of 1.95 µg/mL, at aeration of 140rpm, but not at higher speeds. The crude extract exploited by Thronton media was categorized as nontoxic by NCI (National Cancer Institute) which defined IC50 of crude extract over 30 µg/mL as noncytotoxic (14, 32). The tested SUK 25 extracts were nontoxic against mammalian Chang liver cells with IC50 values of 43.31 ± 1.24 µg/mL. In addition, Malebo et al. (33) reproted that the range of toxicity was divided into four stages according to extracts concentration from highly toxic to non-toxic to human cells. Concentration of extracts less than 1 μg/mL was categorized as highly toxic to human cells. The concentrations between 1 μg/mL to 10 μg/mL of the extracts were categorized as moderately toxic. Next, mild toxic class had fallen into the range between 10 μg/mL to 30 μg/mL. Lastly, nontoxic extract concentration was classified as more than 30 μg/mL. Therefore, it is important to further investigate this crude extract for cytotoxicity test against cancer cells, to develop bioactive compounds from the nature. According to the results of the current study, SUK 25 was a potential source of anti-MRSA agent from Streptomyces sp. and optimum culture conditions for anti-MRSA activities from SUK 25 extracts obtained in Thronton media with initial pH was pH 7 and aerated at 140 rpm. Hence, the SUK 25 crude extracts have a huge potential to be explored as anti-MRSA agents for future drug development. The authors appreciate the financial support from the Ministry of Higher Education of Malaysia under the grant no. UKM-NN-03-FRGS0042-2009 and Universiti Sultan Zainal Abidin (UniSZA). Funding/Support: This study had received financial grant from Ministry of Higher Education of Malaysia under the grant no. UKM-NN-03-FRGS0042-2009.